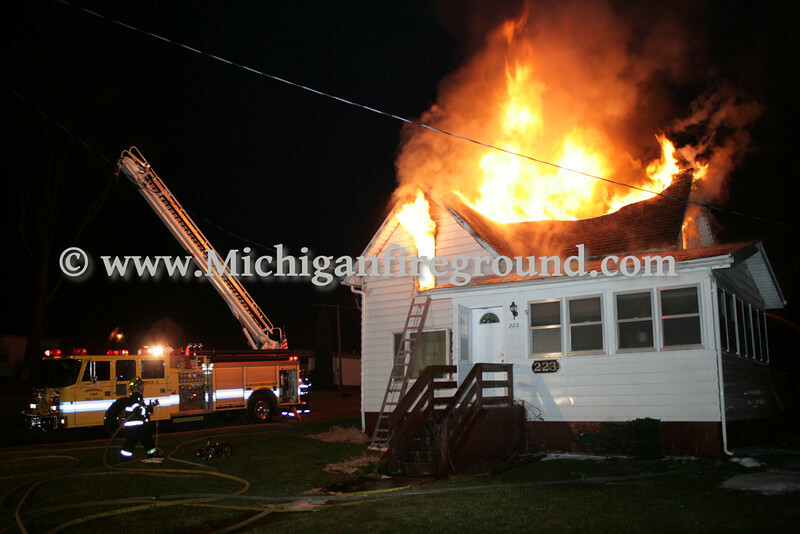 The Rives-Tompkins Township Fire Department responded to a house fire at 223 Main St around 4 AM on Thursday, January 26, 2012. When firefighters arrived, smoke was coming from the second floor and attic. Mutual aid was requested from the Henrietta Township and Onondaga fire departments to assist. Personnel had difficulty gaining access to the flames which had already extended into the attic. Eventually the fire started venting thru the roof and all personnel were pulled out of the building. Additional mutual aid was requested from the Leslie, Springport and Parma fire departments for tankers & manpower. Primary pumping was switched to Onondaga 1260 for an aerial attack. Tankers shuttled water for several hours until the fire was brought under control. Fill sites were established at Rives Station 1, located a block west of the fire, and at a draft site from a stream another 1/2 block down the road. The residents were home at the time of the fire and were alerted by smoke detectors. They safely evacuated and went to a neighbors house to report the fire. There were no injuries.